ALEPPO: Syrian troops cemented their hold on Aleppo on Friday after retaking full control of the city, as residents anxious to return to their homes moved through its ruined streets, reports AFP. Syria’s army announced on Thursday it had recaptured the former rebel stronghold of east Aleppo following a landmark evacuation deal that saw thousands of opposition fighters and residents bussed out. 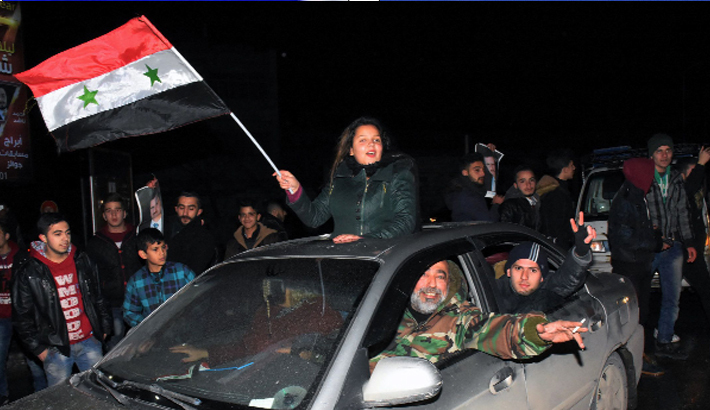 It was the biggest victory for President Bashar al-Assad’s forces in nearly six years of civil war and a major win for his foreign backers, with key ally Russia hailing the recapture as “very important” step. Braving the cold, war-weary residents crossed districts that had become infamous front lines, eager to return to neighbourhoods they had not seen in years. An AFP correspondent saw civilians wrapped in coats trekking through the cold, some rolling their belongings on wheelbarrows. “I came to check on my house, which I haven’t seen in five years,” resident Khaled al-Masri said. “I really hope my home wasn’t badly damaged.” The evacuation operation ended more than four years of ferocious fighting inside Aleppo, which had been divided between government forces in the west and rebels in the east. Opposition forces remain in control of areas west of Aleppo and on Friday at least one civilian was killed in the first wave of rebel rocket fire on the city since it fell under government control, the Syrian Observatory for Human Rights said. Eight people were also wounded in the fire on the Al-Hamdaniyeh district, the Britain-based monitor said, while state news agency SANA reported three killed. liberation of Aleppo from radical elements is a very important part of the normalisation in Syria, and I hope, for the region overall,” President Vladimir Putin said. The Kremlin also announced that Putin had signed an order to expand Russia’s naval facility in the Syrian city of Tartus. On Friday morning, government fighters moved into Ansari and al-Mashhad, two neighbourhoods they had not entered since mid-2012. They searched for improvised explosive devices and mines, clearing buildings in anticipation of civilians returning, the Observatory said. In Bustan al-Qasr, a heavily damaged neighbourhood near Aleppo’s famed old city, small bulldozers removed rubble from the streets.